Shopping, either purpose-driven or recreational, gets kicked up a notch when you enter a club or big box store. You wonder if you will “score” a big save and find that item you not only need but also at a super value. Regardless of the locale, the ability of a package to generate maximum visual impact and stand out is critical. In a conventional retail environment, your product has to stand out while being surrounded by other competing products and packages vying for the same sale. In the club store environment, you have less competition in terms of product variety and variation crowding your product, and because you are typically selling cases or pallets of a single product, you have the unique ability to convert your package graphics into a brand wall that consumers can’t miss. 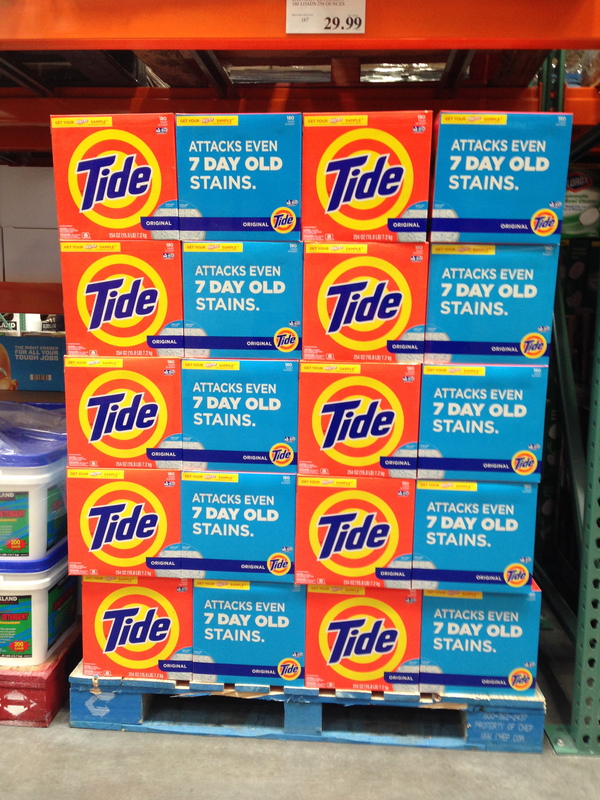 While perusing the aisles of my local club store recently, I was literally confronted with the impact of the Tide® powdered laundry detergent pallet on display. I was impressed with the high degree of thoughtful consideration that was put into creating a package and display that immediately communicated with me and yet did so with quiet efficiency and directness. Each individual carton on the pallet was divided so that two front and side panels were set up in bold brand colors and two front and side panels were set up in secondary accent colors – and in both cases the graphic design capitalized on bold color palettes to capture attention and create strong color blocking. Two panels of the package featured large super graphic logos on the traditional Tide orange background, which was stripped clear of anything that was unessential. Die cut windows in the lower corners provided a clear display of the product inside. The two opposite vertical panels were devoted to primary benefit statements in bold white copy reversing out of a bright blue contrasting background. The brand colors, which already had a high degree of fluorescence within, complemented each other while creating maximum visual contrast as they stood next to one another on the pallet. Beyond the straightforward use of color, the orientation of graphics on the vertical panels when the cartons are stacked on the pallet creates strong color-blocked columns and provides simple and direct repetition of the brand and the key brand promise – Tide 100% Satisfaction Guaranteed. In an environment where products have to sell themselves, Tide has designed its packaging panels to deliver its brand message so that it is legible from ANY distance – you simply can’t miss it. Best of all, when cartons are removed from the pallet, the integrity of the display remains in tact and continues to communicate. 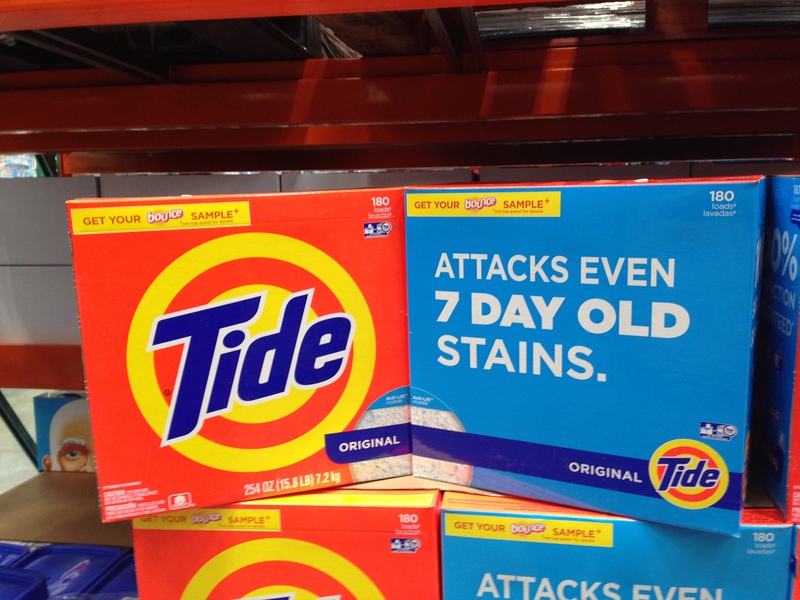 Everything you need to know about the brand is presented in a direct extension of the Tide brand family. 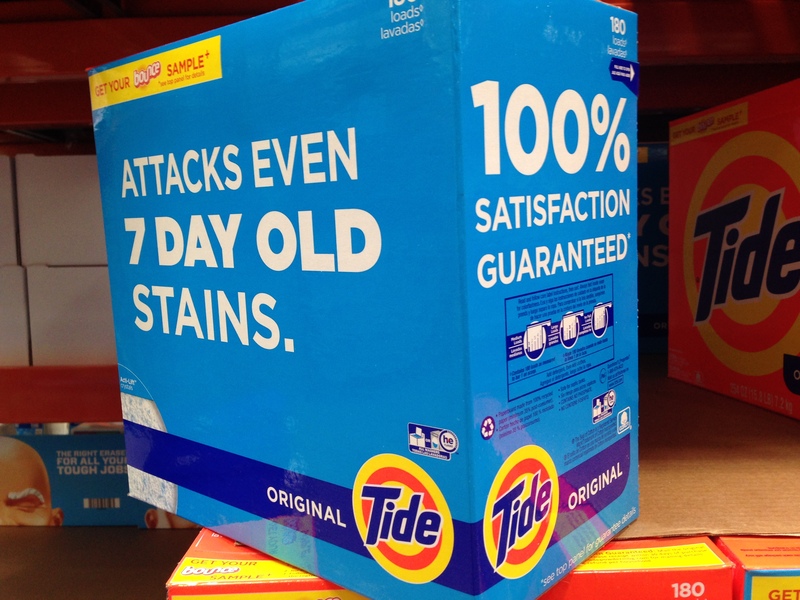 In fact I prefer the clean, straightforward club store design to packaging at retail stores, where the Tide logo becomes proportionally smaller and “enhanced” by design elements acting as messaging cues. The Tide club package represents a great example of the synergistic planning it takes to align branding, carton sizing and pallet loading to deliver an impressively strong presence in a club store environment. In a setting where there is little opportunity for in-store promotion, here is packaging that is its own promotion; in fact this is one of those rare instances where the 5 in 5 rule doesn’t even get out of the gate because the package/display is the first thing the eye tracks to when approaching the aisle – which is nothing short of incredible. This design capitalizes on the strength of the brand colors and iconic logo, which not all products are able to do. The simplicity of this design approach is something that should readily be used as a standard for club store displays. Are you looking to achieve standout packaging? Our design experts can help. Contact us at 920-725-4848 or info@brand-directions.com. We also invite you to view our white paper 4-D – Designing packaging for the club store environment.